Researchers are making a link between advanced stage macular degeneration and a hormone secreted from central body fat. The ramifications of this discovery are profound and are likely to save the sight of millions of senior adults. First some background information. When light receptor (photoreceptor) cells at the back of the eyes are deprived of oxygen, new blood vessels outcrop to counter this problem but invade the bloodless visual center of the eye (the macula). The outcropping of these new blood vessels is called neovascularization or angiogenesis. Eye doctors call this wet macular degeneration, which is the fast progressing neovascular form of the disease that can permanently destroy vision, leaving a subject legally blind. Fortunately medicines needle injected into the eyes cause these new blood vessels to recede, though the treatment is not foolproof. But sadly, about 15% of patients with the neovascular form of the disease do not respond to treatment. Repeated treatments are required, about once every month. It has been known for some time now that fat cells (adipocytes) secrete a hormone called adiponectin. (pronounced a-dippo-nek-tin). Adiponectin inhibits insulin resistance and the buildup of atherosclerotic plaque in arteries. The newly reported discovery is that omega-3 fish oil (EPA-DHA) increases adiponectin levels secreted from fat cells in your mid-section and suppresses abnormal blood vessel formation in the retina of laboratory animals. 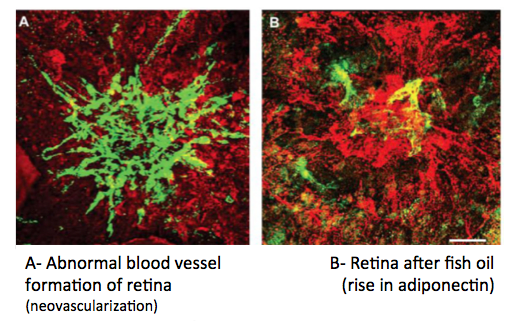 Blood levels of adiponectin may be newly reported to curb the progression of macular degeneration but actually this connection was reported five years ago. In 2012 it was reported that adiponectin inhibits the area of abnormal blood vessels by 99%. [Biochim Biophysica Acta Aug 2012] An even earlier report was also published in 2009. [Cell Biology International July 2009; Circulation Research May 8, 2009] So ophthalmology has been sitting on its hands over this discovery for at least 8 years. Ophthalmology chose to ignore this compelling research and allow cases of macular degeneration to progress to an advanced stage when expensive monoclonal antibody drugs at a thousand dollars a pop could be used to temporarily quell the invasive blood vessels. Mid-section body fat accompanied by insulin resistance is the key factor in the development of metabolic disease and subsequent deterioration of the circulatory system as evidenced at the back of the eyes. It’s obvious. Big Pharma doesn’t want fish oil and resveratrol. In one fell swoop, cardiologists, diabetologists and ophthalmologists are out of billions of health insurance dollars. All are natural remedies that don’t require a prescription. Prevention doesn’t pay health professionals but it does save eyes and hearts and lives. Modern medicine will make sure there is never enough evidence to prove fish oil and resveratrol have any place in modern medicine. And the frightful reality is that most people won’t start supplementing their diet with fish oil and resveratrol until irreversible changes occur in their eyes. By then they are placed on myriads of inappropriate drugs and are fearful of weaning away from them. ©2017 Bill Sardi, Knowledge of Health, Inc.